The graphics really are incredible, so well done on that. I watched the 1st and 2nd level and they looked good from a story standpoint. I get that it's COD, but I just wish they could tone down the action scenes. Like dragging my friend through the dirt and fighting off Nazi's one-handed. Or jumping onto a Flak gun and taking out like 10 Stukas. I think they could tone that stuff down and make it slightly more realistic and not lose anything from the Singleplayer experience. Would love to see all this artistic talent coupled with handwork and some critical thinking to put it in a more historical accurate setting. I like this thread. People, who are out of the target audience blame a game for being wrong in their eyes. I try not to care to much. I still like CoD for its cinematic like campaigns. They are not difficult, nor they require you to think alot. Just play along. And this is cool, especially if you think in terms of people, who just lack the time after a long work day to actually learn a game. And yes, even CoD is here over the top. Has anyone seen gameplay of the derailing armored train? The train crash lasts for minutes. It is like the helcopters in MW2 or 3, which kept falling down even half an hour after the EMP from the nuclear detonation. Totally over the top and somewhat stupid. But watching those scenes I cannot get rid of the feeling, that even the developers see this atleast partly in a parodistic way. They know how stupid this is. And in terms of multiplayer, they have certainly delivered a multiplayer with a working balance. I mean, what is the purpose of all the different guns? From a design perspective, all the guns need to fill in a certain gameplay role. Slow firing, high damage weapons, long range accurate MGs, with obvious disadvanteges in shorter ranges, shotguns for short range and so on. In the end the game design is nothing more than for example quake with its high damage railguns, fully automatic MGs and shotguns. Each weapon requires a certain gamestyle. With the same in mind the perks and upgrades of the weapons are designed. For a certain playstyle. And then the multiplayer is still something, which is easy to learn, but very hard to master. They just sticked to what worked for them. And I cannot even blame them for this. I probably will have a look into the game in a year or two, when it is cheap. What I do not like anymore about the games nowadays are first of all the DLCs. Everything from maps to weapons comes in pieces. This is kind of nice, as it keeps the game alive, however the biggest downside is (apart from money), if you buy the game a year or two later in a GotY edition with everything included, the community and action is kind of dead. The game is finished and people dont care anymore. There is few community action, as a newbie you always feel like an outsider. And in my concluding words, this made me think. Gunplay wise FH2 is the complete opposite. All weapons are deadly. All rifles work the same, apart from some minor differences and everything is deadly. In theory, you could switch most weapons with each other (e.g. Bren for MG26, any bolt action rifle, any Semi-automatic rifle). Here, the weapons are not designed for a gameplay reason, but for the love of it. And balance comes not from weapon balance, but from maps. And balance in FH2 is no mirror balance. This is what I enjoy the most, but probably will never been found in a prominent AAA title. But I dont care. I am part of FH2 community. I'd like to update my review a bit after watching almost all the missions now (I've finished watching the Hill 493 level). Actually the gameplay is not bad . If you stripped the game from its cutscenes, quicktime events, and other useless features, you have yourself a classic Call of Duty game. For example, the Operation Cobra level: you start by riding on tanks then assaulting German positions, using flak gun on stukas and in the end assaulting with your tanks the last German defenses. I could really see this as a level from CoD1 or CoD2. 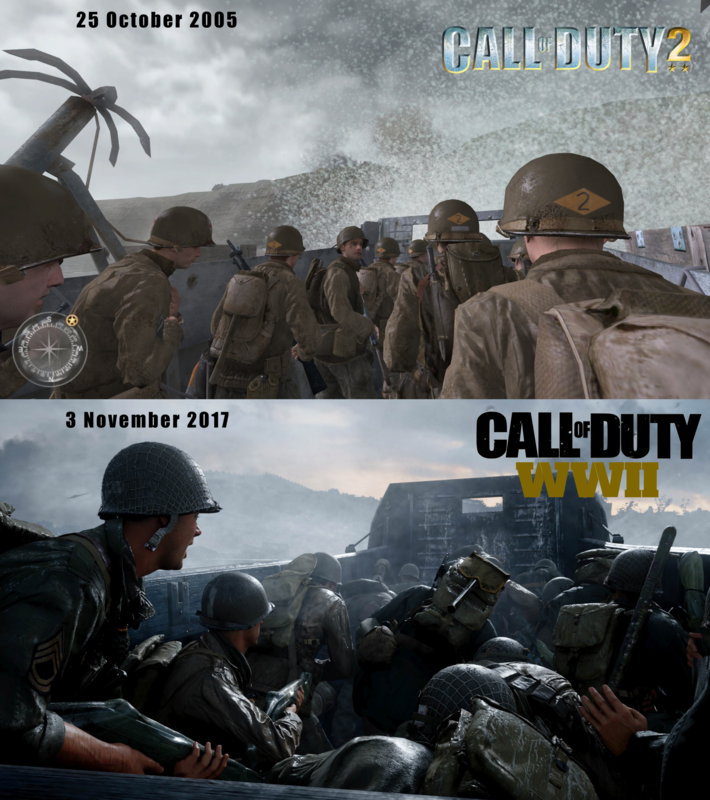 Call of Duty is no way historically accurate, but it has enough to immerse yourself in the battle. I think my favorite level so far has to be the undercover Paris mission where you have to show documents to German officers to let you pass. This level reminded me a lot of Medal of Honor's undercover missions. It's great to see this concept in a CoD game. I don't know, I was expecting much worse from this game's SP campaign but it doesn't seem all that terrible (from a casual perspective). I quite like the new mechanics of friendly soldiers throwing you ammo, grenades, health, or mortar strikes when you need them. I mentioned this before but I love the readdition of the health meter. Atleast CoD2 got Point Du Houc correct. The Thunderbolt looked like a P-36 IMO. Unless that was not the D variant.